← The NEW Icom ID-5100 D-Star mobile radio! Well, I finally traded the venerable Chrysler Aspen for a 2014 Ford Explorer Limited. Fortunately, the 7100 installed in the Explorer without any difficulties. I actually found more room under the seat for the radio body and all related wires and accessories. Running the cables to the control head was no problem, and the control head fit like a glove in the small front compartment in the console. The set up is exactly the same as I had in the Aspen and is working perfectly so far. Here’s a photo of the control head in place. Note that I have not secured it in any way as the snug fit holds it firmly in place. This entry was posted in Uncategorized and tagged D-Star, IC-7100. Bookmark the permalink. 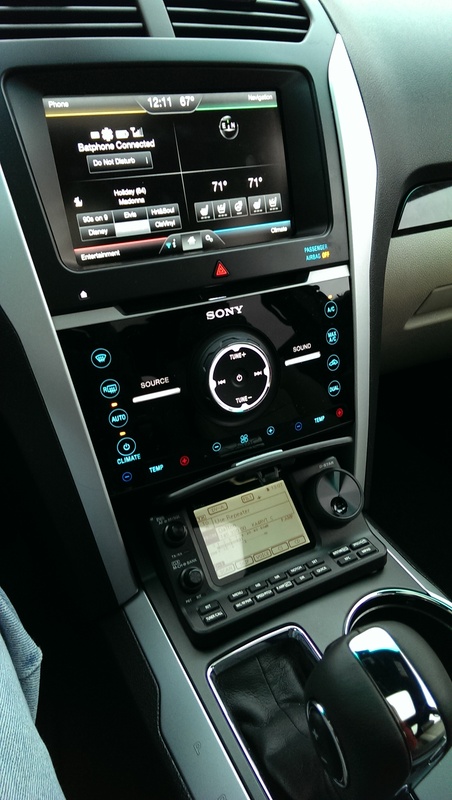 Looks like a real nice fit for that vehicle… How’s the noise level on HF in the new Ford? I just purchased a 2013 Ford F-150 FX4, basically loaded like the Limited, but blacked out for style. I’m about to order up and install one myself. Right now, I’ve got a Kenwood TS-480SAT with a High Sierra Sidekick antenna and TurboTuner. Do you have any photos of the antenna installs on your explorer?? How do you like the explorer so far? Question, when you used the Byonics GPS receiver and connected it to the IC 7100 cable did you have to modify the cable end to male? @Jerry – The noise level in the Explorer is fine. I do have some ignition noise, but have found that the NB in the 7100 completely eliminates it. @Scott – I will try to find time to post photos of the antennas. It may be in a separate post on the blog. @Rick – Byonics sells the cables that you would need to use. As I originally purchased this GPS receiver for use with a Kenwood 710, I did have to modify the cable to switch the tip and ring to be a null modem configuration. Thanks for your response and suggestions. I completed my mobile installation today of the ICOM IC-7100 with the Byonics GPS5 GPS receiver and their GPAC coupled to a male to male DB9 null adapter. This was connected to the ICOM OPC 1529R cable. I was looking for a plug and play solution and this worked perfect. Great installation . I have done the same in my camper van . Two issues come to mind . 1. The GPS does indeed find near DV repeaters , yet on the Icom 5100 and 51D handheld ,will also find nearby analogue repeaters . Have you got your 7100 able to locate all types of nearby repeaters please ? 2. Did you measure peak RF output power on the various bands accurately on high power ? Some people are finding the most they can get on HF more like 60 Watts rather than the quoted 100 Watts ?